J.D. Irving, Limited and the University of New Brunswick are pleased to announce the 2017 recipients of the JDI NB Scholarship at UNB. Desiree Pictou, above, left, currently lives on Ugpi'Ganjig, Eel River Bar First Nation in northern New Brunswick, and will be starting her degree in business administration in September at UNB’s Fredericton campus. Caroline Burpee from Jacksonville, N.B., will be attending UNB’s Fredericton campus in September to pursue a degree in engineering. She has expressed a desire to live in New Brunswick in the future to be near her family and hopes to work at J.D. Irving, Limited. The two 2017 entrance scholarships are valued at $8,000 per year, and are renewable up to $32,000, based on academic performance. The scholarships are funded by a $1 million gift made in 2007 by J.D. Irving, Limited to UNB that will allow talented New Brunswick students to fully apply themselves to their course work and secure a future career without a heavy student debt load. The scholarship is awarded to students who are enrolled in an undergraduate degree program in the field of business administration, computer science, information systems, software engineering, forestry, environment & natural resources and engineering. “The energy and enthusiasm both of these young graduates have for our home province of New Brunswick is inspiring. We are very pleased to be assisting these two hard-working students. Congratulations and best wishes as you begin your university studies this fall,” said Colleen Baxter, vice-president of human resources at JDI. “We value our partnership with UNB and are proud to employ over 650 graduates of the university on the JDI team." “At UNB, we are very pleased to have such a strong partnership with JDI. 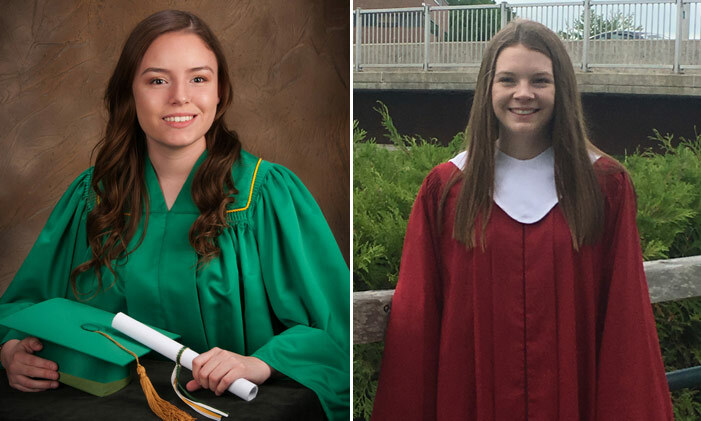 The company’s continuing commitment to us – and, in particular, to deserving young people such as Desiree and Caroline – is deeply appreciated.” said George MacLean, UNB vice-president academic on the Fredericton campus.